The uncompromising, durable build of Heavy Duty View Binders with Extra Durable Hinge is enhanced by clear view covers and spine. 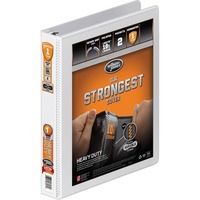 Featuring Wilson Jones' strongest covers and made of Wilson Jones' custom formulated, PVC free polypropylene, these binders last up to 10 times longer than ones made of vinyl and are better for the environment. Heavy duty binders also feature never gap rings for secure and snag free paper storage. Three never gap round rings provide spill free document security. Customizable cover and spine simplify binder labeling and personalization. Two interior pockets provide space for additional documents.